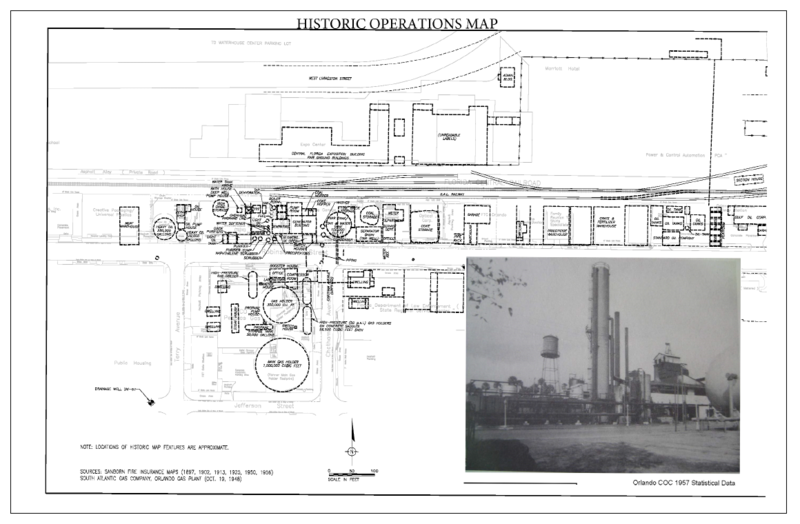 From approximately 1887 to 1959, a manufactured gas plant was operated on roughly three acres of land on West Robinson Street near Chatham Avenue. This plant was one of more than 3,500 across the country. Although the plant was considered state-of-the-art at the time, operations came long before knowledge of the potential impacts of contaminants and the implementation of modern environmental regulations. As a result, chemical residues were left at the plant site to a degree that would not meet today’s environmental standards. Investigations to address the residuals of the site are being completed under the authority of the U.S. Environmental Protection Agency (EPA) and are supported by the Orlando Gasification Plant Site Group. Beginning in the 1850s, before natural gas was widely available, gas to heat homes, light streets, fuel industry, and for cooking was manufactured from various combustible materials, such as coal, coke or oil. These materials were placed in large ovens and heated to high temperatures in an environment with limited oxygen, producing a form of gas that was distributed throughout the city and used in much the same way as natural gas is used now. These facilities were known as manufactured gas plants (MGPs) and operations were considered state-of-the-art in their day, generally complying with the regulations that existed at that time. However, few, if any, environmental requirements existed until long after the plants had been shut down. 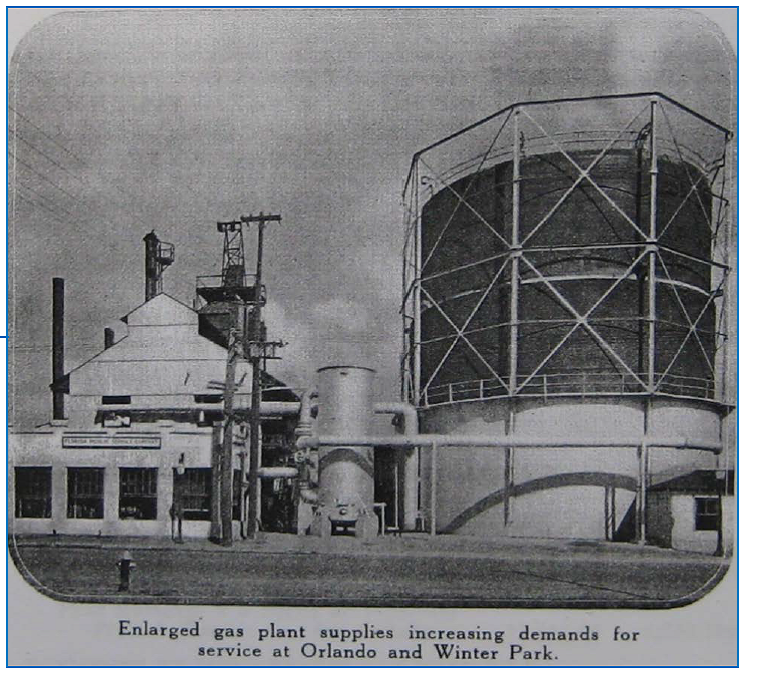 The last of these plants were shut down in Florida during the early 1960s as natural gas was made available throughout the state. When the MGPs were shut down, the plant equipment was usually removed, and the demolition debris, along with byproducts that could not be recovered and sold, was usually abandoned in place. Long after MGPs had ended production, federal and state agencies determined that certain byproducts, including coal tar, pose potential hazards to human health or the environment under certain conditions. State or federal agencies may require that impacts be removed, contained or otherwise addressed when potential hazards to human health or the environment may exist now or in the future. Over the past several years, the Orlando Gasification Plant Site Group has conducted numerous environmental studies and assessments of the site under the direction and guidance of the EPA and the Florida Department of Environmental Protection. Initial investigations indicated that byproducts of former gas production, such as coal tar, are present in soil and groundwater in the vicinity of the site. Drinking water for the surrounding communities comes from municipal wells, which are located in a different area and at a significantly greater depth. The Orlando Utilities Commission routinely samples all of its wells, and no contaminants from the site have been found in the municipal drinking water supply. A Consent Decree outlining the portion of the remediation plan that has been approved to date was executed by the EPA, the U.S. Department of Justice and the Orlando Gasification Plant Site Group, and lodged on January 8, 2015, in the United States District Court, Middle District of Florida. The Court entered the Consent Decree on March 18, 2015. Since that time, planning and testing of the remedial design occurred under the direction and guidance of EPA. With approval from EPA, initial construction began in June 2018, concluding six months later in December 2018. Work on the second phase, beginning in early April 2019, will involve the construction of an underground barrier wall around the site to ensure impacts cannot migrate and injection of oxygen into the groundwater to reduce concentrations of any impacts outside the barrier. Second-phase work is expected to conclude by the end of 2019. Maintaining the health and safety of those working on site and those living or working near the site while performing a successful cleanup is the top priority. Detailed information about the remediation plan is available on the EPA website. Work on the second cleanup phase calls for the construction of an underground barrier wall around the site to ensure impacts cannot migrate and injection of oxygen into the groundwater to reduce concentrations of any impacts outside the barrier. These remedies are based on scientific and engineering best practices. Contractors will be required to follow emission control procedures to minimize any impact on the surrounding neighborhood. Following the completion of the second phase of OU1 remediation, follow-up operation, monitoring and reporting for groundwater remediation equipment is anticipated to continue for up to five years. The remedy selection process continues for OU2. The EPA is completing regulatory review of a pilot study to gather additional data on deep ground water. The pilot study will last for a number of years, depending on its results, and at the conclusion, the process of selecting a permanent remedy will begin. Any remedy the EPA ultimately selects will be published for public comment. The community will be notified prior to any onsite construction activities.